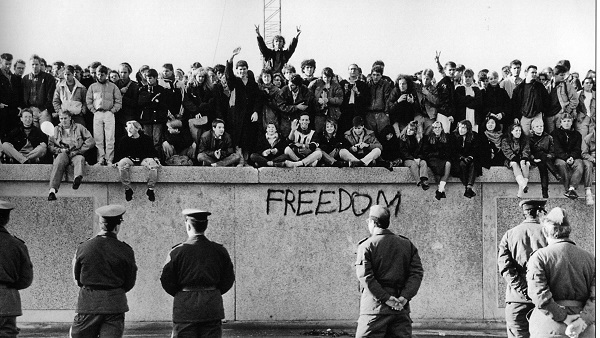 In November, 1989, East German students sit atop the Berlin Wall at the Brandenburg. My entrepreneurial journey has included learning about literacy and numeracy of business, economics, history, and politics and all that affects the prosperity of a country. But it has also included connecting these issues with the essential Biblical, theological connections and insights. We were stationed in the US Air Force at Bitburg AB, Germany from ’87-’90, where the US helped protect NATO from the encroachment of communism. But we never considered we’d see history in the making, our “front row seats” saw the before and the immediate after-effects of the fall of the Berlin Wall in 1989 and the collapse of communism after that. The recent history of Germany’s unification recovery and Venezuela’s economic collapse shows all of the economic errors made, corrections, and the successes, too, within a typical lifetime. But now, with the recent 2018 US election, socialistic policies have once again reemerged in the “Green New Deal.” It has started with a pair of FDR-like “New Deal” tax and spend resolutions, H. Res. 109/ S. Res. 59, sponsored by Rep. Alexandria Ocasio-Cortez (D-NY) and Sen. Ed Markey (D-MA). As Ronald Reagan often quipped during debates, “There you go again.” Both resolutions offer a return to more economic draconian socialist policies, the very thing the Berlin Wall and Venezuela have proved does not work. Our own “Green New Deal” will become the newest “There you go again” award winner that socialistic policies do not produce more economic prosperity. The Berlin Wall kept people within and under a totalitarian system of communism. Within hours of a November 9th, 1989 news reports that the East Germany border was open, “at least 20,000 people are now crammed behind the Bornholmer checkpoint.” Then, days and weeks later, the “woodpecker” hammers chipped bits and pieces of mementos of the wall out (and then the selling of “fake ‘certified’ wall pieces” to tourists began), but the flood of thousands of people through the open border had begun. The small hammers were then replaced with East German government bulldozers about a year later. Freedom had sprung. With the fall of the wall came the elation from the East German people that now liberty and freedom and the hope of prosperity for all were now within reach. Reporting at the time, an elderly mother ask her daughter what all the fuss was about. “ “They’ve opened the border,” Irina says. “Does that mean we’ll have capitalism now?” “Yes, it probably does.” “Well, in that case, I’ll hang around for a few more years and see what it’s like.” ” It took time, but capitalism and freer markets did come, but not without its growing pains, fits, and starts. When the Berlin Wall fell, people scrambled to visit, then began moving to West Germany because life was better in West Germany. The dozens of Cuban boat people leaving their communistic country for the shores of liberty in Florida paled in comparison to the thousands of people crossing their newly opened border, first to see if they were really free. Later it turned into an influx which overloaded West Germany cities, villages, and governmental systems, but the unification of Germany had started. The drive toward prosperity is built into each of us, some more than others. But the key to this progression and the unleashing of prosperity for all is following the right habits and disciplines and keeping the bad habits and disciplines at bay and from taking over. In the US today, some consider moving toward a socialist form of government when history proves them wrong time and time again. But what does the Bible say about this issue? Most see the Bible as only a moral code of living, true, but others completely ignore what some of us see: It’s an economic prescription for wealth creation. What happens when a nation fails to follow the Biblical course of wealth creation is detailed in Leviticus chapter 26. It can be called the Five Cycles of National Discipline. Fifth Discipline Lev 26:27-39 and amplified in Deut 28:49-67. Each new discipline starts with the word, “if.” If you don’t change your attitude, thinking, and pivot back to doing good, the next discipline in your spiral downward will happen. God always provides an opportunity to reverse your course. Much like Noah and Jonah, each telling their target audiences to pivot back toward God. Noah’s crowd refused, and they died, Jonah’s target audience changed their minds and prosperity returned. How does a nation recover? Lev 26:40-46 gives us the first steps toward recovery. It’s not easy to make amends. If you don’t think change can happen, then watch Ruth Richardson, New Zealand’s Minister of Finance from 1990 to 1993, when she played a pivotal role in the radical transformation of her country’s economy. By 1996 New Zealand was one of the few countries that had a budget surplus. Even in our own country’s economy, President Coolidge and his Secretary of Treasury Andrew Mellon cut both taxes and spending early in the 1920s so that by the end of the Roaring Twenties decade we paid down our national debt by ? from $24B to $18B. But God tells us how to prevent the five “ifs.” He outlines the primary “if” in verse three: “If you walk in My statutes and keep My commandments so as to carry them out, then I shall give you rains in their season, so that the land will yield its produce and the trees of the field will bear their fruit” (Lev 26:3-4). To create a prosperity pivot, follow God’s economic plan.